"This meatless comfort food is packed with high-antioxidant vegetables, plus curry's anti-cancer curcumin." Preheat oven to 400 degrees. In a large skillet over medium heat, heat 1 Tb. oil; add onions, garlic, curry and cumin. Saute until onions are soft, about 5 minutes. Remove to a bowl. Heat remaining oil in skillet; add peppers, eggplant, tomatoes and 1/2 cup water. Saute until soft, about 20 minutes. Stir in onions. Place in a shallow 8-by-8- inch baking dish. In a saucepan, boil potatoes until done. Drain and smash. Stir in half and half, peas, salt and pepper. Spread over vegetables and top with Parmesan. Bake 15 minutes. Brown in broiler. Serve. Learn how to make a meat-free shepherd's pie. 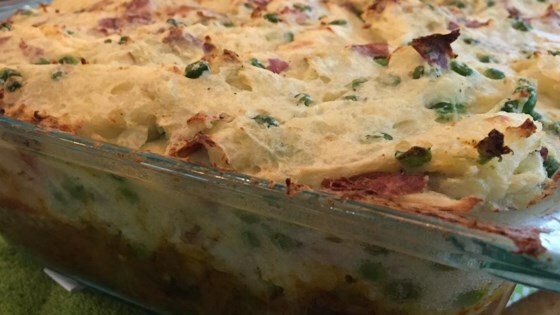 Very Tasty Recipe, I never made a vegetarian shepherd pie, just your normal with meat. I think I'll try it with some mushrooms next and other things. Will take picture next. Delicious! I used zucchini and some leftover mashed potatoes from Christmas dinner. It was great!